* This is my article in BusinessWorld on April 26, 2017. Thanks to its rapid economic growth, the Association of Southeast Asian Nations (ASEAN) is being looked up to by other economic blocs as it celebrates its 50th anniversary this month in Manila. The pace of trade liberalization until this decade is perhaps the world’s fastest both among ASEAN member-states, and even among those outside the group. Free trade creates good will among people and governments across the globe. It gives foreign trade partners greater access to the home market and, in the process, these trade partners tend to open up to more ASEAN countries’ exports and investments. Here are two tables that show the economic wonders of free trade policy -- not exactly zero-tariff and minimal non-tariff barriers (NTBs) but approaching there -- for the emerging economies of Asia. We will use the purchasing power parity (PPP) values of gross domestic product (GDP) to somehow equalize valuation of goods and services across the world. 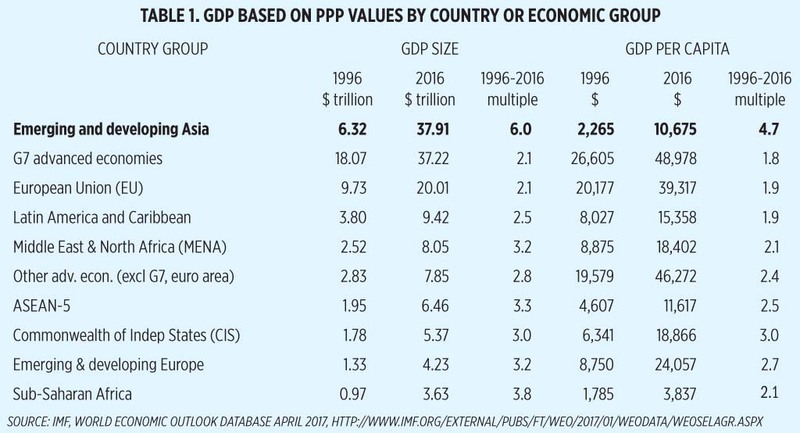 Overall, the GDP size of the world at PPP values was $40.3 trillion in 1996 and it rose to $120 trillion in 2016 or an expansion of more than three times in just two decades. ASEAN-5 refers to Indonesia, Malaysia, Philippines, Thailand, and Vietnam. G7 countries are the US, Canada, Japan, UK, Germany, France and Italy. 1. Emerging and developing Asia (including China and India) is now the world’s biggest economic bloc with GDP size of $38 trillion in 2016, overtaking the G7. The expansion of GDP size in just two decades was six times, an astonishing feat. The per-capita GDP also expanded almost five times, the fastest in the world. 2. ASEAN-5 GDP size of $6.5 trillion in 2016 was larger than the combined economies of the CIS or developing Europe or Sub-Saharan Africa. 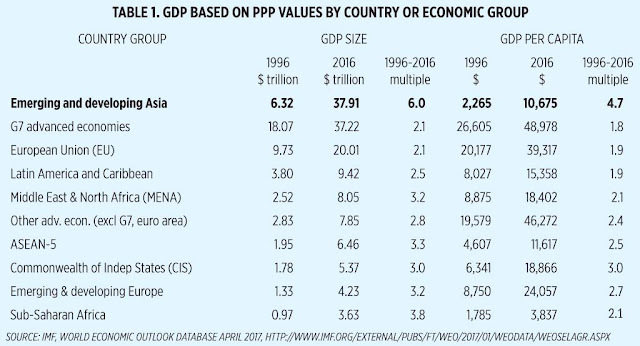 Per capita GDP expanded more than two and a half times over two decades which is larger than that attained by many other economic blocs. 3. While emerging and developing Asia is only the 3rd largest bloc in the exports of goods and services in the world, selling $3.9 trillion in 2016, the size of exports has expanded 7.2 times after only two decades, the fastest in the world. In terms of price inflation, the region also showed consistent price decline and stability at only 2.9% in 2016, the lowest among developing blocs in the world. 4. Sub-Saharan Africa and MENA remain burdened with high prices and slow expansion in exports. Giving local consumers and manufacturers more economic freedom where they can buy and sell the various goods and services that they need and produce means empowering the whole economy. Price declines and price stability are proof that freer trade is working and are instrumental in stabilizing the supply of various traded goods and services. There are winners and losers in free trade, the same way that there are winners and losers in protectionism. But overall, “net gains” from trade trump “net losses” from protectionism because locals are deprived by policies that limit choices and options. 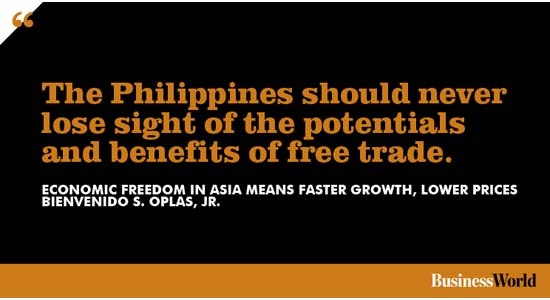 It is important therefore, that emerging Asian economies like the Philippines should never lose sight of the potentials of free trade and resist protectionist aspirations that penalize the consumers while protecting local vested business interests. Bienvenido S. Oplas, Jr. is the President of Minimal Government Thinkers and a Fellow of SEANET; both are members of Economic Freedom Network (EFN) Asia.